Butagumi Shokudō is located in the basement of the Roppongi Hills North Tower. 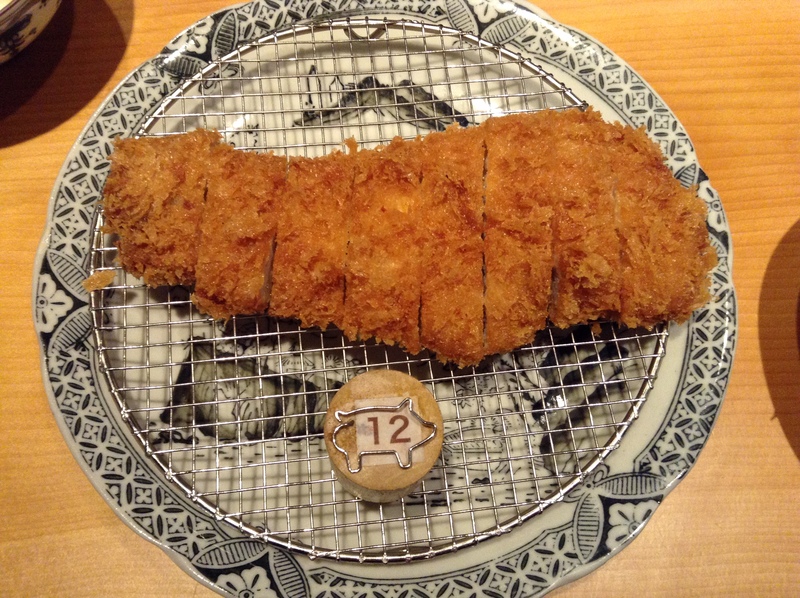 There are about a dozen counter seats and several tables in back at this popular tonkatsu spot. Take-away bento and tonkatsu sandwiches are also available, but the best tonkatsu is eaten right away as it comes out of the deep-fryer. At the counter you can watch as a chef trims away fat from big slabs of pork. The frying is done in the back of the house. One of the pork used at Butagumi is the Tsubaki Sangenton (椿三元豚) from Chiba. It is a tender, light pork. The aka (dark red) miso soup comes with slippery nameko mushrooms. The salad can be topped with a refreshing yuzu ginger dressing. The main branch, Butagumi, is in Nishi-Azabu and has a long list of pork to choose from. Consider Butagumi Shokudō (dining hall) the café branch of the honten for an abbreviated menu and a quick meal. The music on a recent day was hits from the 80s from Bruce Springstein and Michael Jackson, which made the meal all the more comfortable.